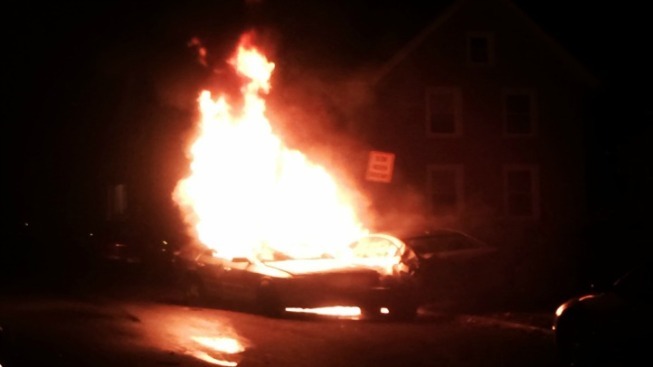 One person is dead after a car slammed into several parked cars in Meriden and burst into flames. The fatal crash happened just before midnight on Friday. Witnesses say the driver of a 2000 Lincoln driving down Crown St. went off the road and hit a handful parked cars on both sides of the street before catching fire, according to Meriden Police. Witnesses told police they saw a passenger in the Lincoln escape the flames and run from the scene. Officers used police dogs to search for the passenger but were unable to find that person. The driver of the Lincoln was trapped inside the car and died at the scene. The Medical Examiner will have to use dental records to identify the victim, according to investigators. The cause of the accident is under investigation and anyone who witnessed the accident is asked to call Meriden Police at 203-630-6215 or 203-630-6256.